When you search on Google and include a location in your keyword, such as “Madison Wedding Photographer,” Google is now putting their Google Business listings BEFORE the organic listings in their rankings. These listings are free, so go and get one now! You can find them here. It’s important to fully fill out your profile and start getting reviews if you want to show up in the local listings. Make sure to upload some photos as well, as they sometimes show up there in the search results. It’s a great way to improve your chances of being found on Google when people are searching for a photographer. Social media sites, such as Facebook, Twitter, Pinterest, Instagram, Snapchat, and others can be super useful ways to promote your business. That being said, you have to be super careful not to waste a bunch of time on these platforms as they can be really distracting. I mean, I can go on Facebook to put a post on my business page, and an hour later I’m viewing cat videos and forgot to post altogether. The struggle is real, friends. So, in order to keep from wasting too much time, use a free service like IFTTT to automate your posts. This allows you to post in one place and then have it automatically post that same content on other platforms. This is how to get the best response with the least amount of time wasted. You’ll also want to make sure that your site is optimized for search engines so that you can attract clients who are looking for a photographer like you by searching the internet. In fact, one of the photographers who is in my Marketog course said that with her list of less than 150 people, she’s able to book a full day of mini-sessions simply by sending out a single email. 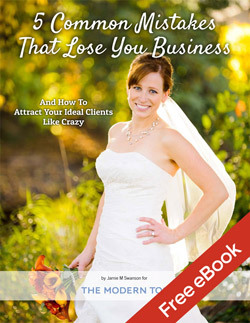 It’s so incredibly powerful for getting more clients. You can use MailChimp for free if you just send out a basic newsletter from time to time, which is the absolute minimum you should be doing. However, I highly recommend using ConvertKit. They do have a small monthly fee to use their service, but the automation they provide will easily pay for the cost, and it’ll cost you less than your monthly Starbucks budget which is well worth it. As an FYI, if you purchase using that link, it pays me a small commission at no extra cost to you, so it’s a great way to say “thanks” for the tips I share with you. So thanks in advance for using it! Get involved with other professionals in your local area. It’s amazing how loyal business owners can be towards each other when you really hit if off. Make sure you’re promoting their businesses to your clients, and they’ll be sure to reciprocate. If you shoot weddings, it’s especially powerful to network with other wedding professionals since you share clients but don’t have to compete for them. 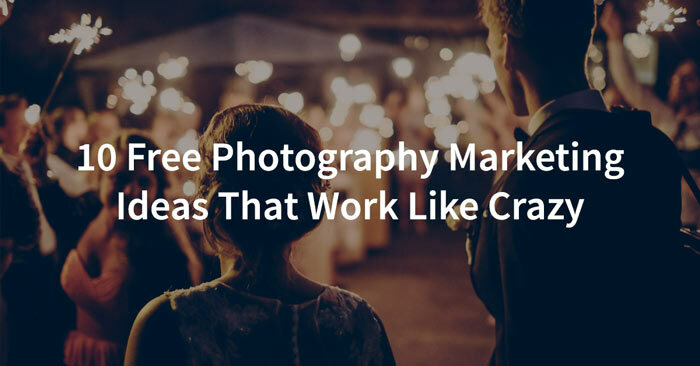 I debated putting this one on here at all because some photographers give away their work for free for too long, but a contest or giveaway here and there can really help boost visibility to your business. My friend Andy and I gave away free wedding photography to one couple each year for the first 3 years of our business as a way to give back to people, and while it has been an incredibly rewarding thing to do on a personal level, it isn’t something that brings in a lot of extra business. Yes, you get some, but generally it’s more about spreading the word about giving back. This is because we’re not offering it to our target market. Our target market can afford higher-end photography, whereas people who enter a contest for something free often do so because they can’t afford the luxury item. It was shocking to me how many people still met with us and booked us while the contest was still open, but our target market would rather book us than wait for the results of a contest but possibly lose their date. To do this to get more clients, you have to make sure that you’re reaching your target market. Offering a free gift or a small discount to people who find two or three friends to all schedule photo sessions on the same day can be a huge motivator for people to find others to hire you as well. Again, we’re harnessing the power of word of mouth advertising, but it’s so powerful that it can’t be ignored. There’s a ton of wedding and portrait blogs out there that feature photography, and there are some portrait blogs that feature portrait photographers as well. Get featured if you can, then promote it where your clients can see it. There’s nothing wrong with reminding them how awesome you are. It’s simply good business. This not only gets your name out there, but it helps you build relationships with other professionals who may want your services or refer you to people they know. There are very few organizations who would turn down free photography coverage for their event. Consider donating a session to a cause that is important to you. Or offer up a free session as part of a silent auction. The possibilities here are endless. Sign up for my free email marketing course, which will give you several different ways to get more clients for your photography business. Click here to learn more and sign up now!